Power washing is an easy and satisfying method of fence cleaning. Just try to look as cool as this guy when you do it. Spring fever is alive and well in northern Virginia, and we have to admit: we’ve caught the bug. The sunshine has taken over our minds, and we can’t think about much other than spring. Last week, while we were waiting for spring to officially begin, we wrote about springtime fence decoration, but before you start decorating, make sure you have a clean canvas to work with. Here are some tips for springtime fence cleaning. For Wood Fences: Wood fences might be the most difficult to clean among the materials we offer, but it’s a labor of love (and isn’t that really all that hard). There are two approaches to take, depending on what kind of equipment you have access to. 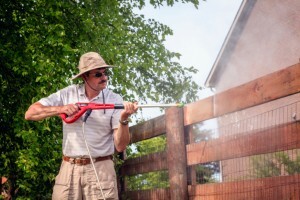 If you have the means to purchase or rent a pressure washer, that can be the most efficient way to clean a wood fence. We have to say that pressure washing can be fun, especially when you see the stark contrast and sharp lines between clean and not-clean. Just be very careful to spray from a safe distance, because the pressure that comes out of that machine can be strong enough to damage the wood. The other option, of course, is a bucket of soapy water and a soft scrubbing device that won’t scratch up the wood. Once it’s clean and dry, a fresh coat of paint or stain will spruce your fence up for spring. For Vinyl Fences: Piece of cake. A bucket of soapy water and soft scrubbing device are all you need here, as vinyl is fairly smooth without many pores for dirt to adhere to. If you need a real deep clean, you can likely find a spray bottle of vinyl cleaning solution at your local home improvement store. For Metal Fences: The easiest of all, this can be taken care of with a spray from your garden hose, and a scrub if necessary (again, with a soft scrubbing tool, so as not to scratch up the finish). This is a great way to get the kids involved in spring cleaning chores. They can help you with fence cleaning, or you can let them take the reigns while you enjoy the weather and keep an eye on them. Spring cleaning season starts now! Get out there and get cleaning! Actually…if you haven’t taken care of springtime fence maintenance yet, hop over to that blog post and check that off first. Okay, now go get cleaning! This entry was posted on Thursday, March 24th, 2016 at 9:03 pm. Both comments and pings are currently closed.